Update: NYC Kids PAC endorses Letitia James for Attorney General, Juma ane Williams for Lieutenant Governor, John Liu in Senate District 11, Blake Morris in Senate District 17, Ross Barkan in Senate District 22 and Jasi Robinson in Senate District 23. This is to add to our earlier endorsements of Jessica Ramos in Senate District 13, Julia Salazar in Senate District 18, Zellnor Myrie in Senate District 20, Robert Jackson in Senate District 31 and Catalina Cruz in Assembly District 39. You can download the flyer to the left here. 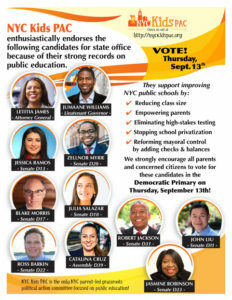 All these candidates had excellent responses to our candidate surveys, and records of supporting our public schools and the improving the quality of education in NYC. Our most difficult decision was the Attorney General endorsement, because we strongly believe both Zephyr Teachout and Tish James would make great AGs, and both candidates have deep understanding as to how to strengthen our public schools. Yet we decided to endorse Tish James because she has always stood up on behalf of NYC parents and joined with them in fighting for their kids’ right to a quality education and a voice in education decision-making, and to force the Mayor and DOE to be more accountable and transparent. The Democratic primary will be held September 13. Remember to vote! In the mean time, we have posted below how to contribute and volunteer for these candidates. Letitia James for Attorney General; contribute here; volunteer here. Jumaane Williams for Lieutenant Governor; contribute here; volunteer here. Blake Morris for Senate District 17; contribute here; volunteer here. Ross Barkan for Senate District 22; contribute here; volunteer here. Please share this info with other parents and allies; and we may have yet a third round of endorsements soon; stay tuned! The flyer can be downloaded here.